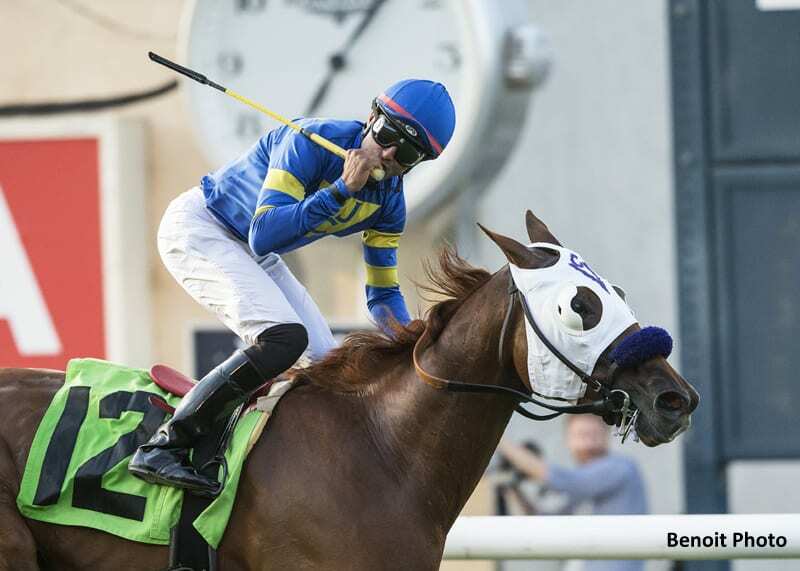 Fahan Mura, a four-year-old filly who's found a home competing over the grass in California, scored her fifth victory in as many starts Friday in the Golden State as she led from wire-to-wire to win the featured $82,125 Osunitas Stakes for older fillies and mares on Friday at Del Mar. Taking command shortly after the break and rating well for jockey Edwin Maldonado, Fahan Mura never was seriously threatened and cruised to the wire a length and three-quarters in advance of 25-1 longshot Achira. MidnightCrossing was third, one length behind the runner-up and a neck in front of fourth-place Compelled. Paradise Woods, the 2-1 favorite, was sixth after pressing the winner's pace. The final time was 1:41.10. Scratched from the mile and one-sixteenth grass race were Melissa Jane, Pyscho Sister, Vexatious and Barleysugar. Fahan Mura, a Pennsylvania-bred daughter of English Channel, was claimed for $40,000 in August of last year by owners Michael Mellen of Bran Jam Stable and partner David W. Clark. After several winless races in New York, the filly was sent to California and turned over to trainer Vladimir Cerin. Starting out in a $32,000 claimer in January, Fahan Mura began a streak of four straight grass triumphs at Santa Anita while moving up in class. Returned to the East Coast in early June to run in the New York Stakes at Belmont Park, she finished sixth after setting the pace. Fahan Mura went to the gate at 6-1 and returned $15.40, $9.20 and $8.20 while earning $48,240. The win was her seventh in 18 starts. Runner-up Achira paid $24.40 and $11.60, while Midnight Crossing returned $6.20 to show. This entry was posted in Racing and tagged bran jam stable, Del Mar, del mar thoroughbred club, edwin maldonado, English Channel, Fahan Mura, michael mellen, New York Stakes, Osunitas Stakes, vladimir cerin by Del Mar Thoroughbred Club. Bookmark the permalink.